Meet the doctors of Tallahassee Podiatry, representing nearly fifty years of experience in Podiatric Medicine! Scroll down, or just click on a doctor to jump straight to his biography and background info. 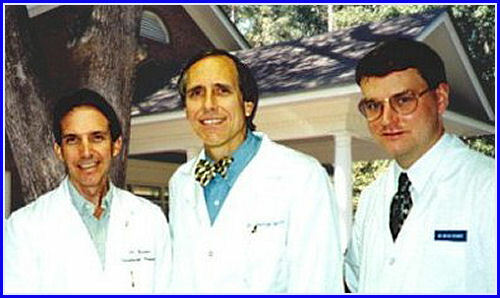 Dr. Merritt has been in practice in Tallahassee, Florida since 1981. He completed his undergraduate degree in premedical biological science, with a minor emphasis in physics. He graduated from the California College of Podiatric Medicine, where he earned his Doctor of Podiatric Medicine degree in 1979. He completed his postgraduate surgical training at the California College of Podiatric Medicine and Hayward Vesper Hospital, where he served as Chief Podiatric Surgical Resident in 1980-81. Dr. Merritt is Board Certified in podiatric surgery by the American Board of Podiatric Surgery. He is a Fellow in the American College of Foot and Ankle Surgeons, and is a Fellow in the American Academy of Podiatric Sports Medicine. His hobbies include weight training, running and tennis. Dr. Rowan, a native Floridian, graduated from Florida State University in 1981 with a degree in Biology/Chemistry. He then earned a Master's degree in excercise physiology from FSU in 1983. Dr. Rowan went on to earn his Doctor of Podiatric Medicine degree from the California College of Podiatric Medicine in 1987. He completed his podiatric surgical residency in Orlando in 1989 at what is now Florida Hospital, where he served as Chief Podiatric Resident from 1988 to 1989. Dr. Rowan is Board Certified in podiatric surgery by the American Board of Podiatric Surgery. He is a Fellow of the American College of Foot and Ankle Surgeons, and is also a Fellow in the American Academy of Podiatric Sports Medicine. He has practiced in Tallahassee since 1989. Dr. Rowan has a special interest & training in the care of chronic wounds He is a staff physician of the Tallahassee Community Hospital Wound Care Center. Born in Augusta, Georgia, Dr. Bryan A. Spooner was raised in Jacksonville, Florida, and has lived in Florida for over twenty years. In 1992, Dr. Spooner graduated from Liberty University with a Bachelor of Science degree in Biology. In 1997, he earned his Doctor of Podiatric Medicine degree from the University of Osteopathic Medicine and Health Sciences, where he was a memeber of the Pi Delta Podiatry National Honor Society. Following graduation, he completed a two-year podiatry residency in Boston at Massachusetts General Hospital. Dr. Spooner has been working with Tallahassee Podiatry Associates since July 1999. Dr. Spooner is board certified with the American Board of Podiatric Surgery. Dr. Pearson graduated locally from Tallahassee Community College and Florida State University. He attended Des Moines Univeristy, College of Podiatric Medicine and Surgery and received his D.P.M. in May 2002. He did a one year primary podiatric medicine residency at Western Pennsylvania Hospital and a two year podiatric surgical residency at the Greater Texas Education Foundation. He was previously in private practice for two years with East Carolina Foot and Ankle Specialists in Edenton, North Carolina before returning to Florida.